As an author, I’m interested in attracting the widest readership possible for my books. That is why I pay attention when I hear or read about any factor that might reduce my readership. One thing I heard is that for every equation you put into a book, you will lose half your readers. 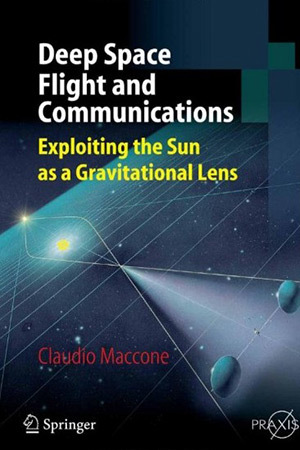 I don’t know if that is true or not, but if it is true, I am probably the only person on Earth who has so far read Claudio Maccone’s Deep Space Flight and Communications, Exploiting the Sun as a Gravitational Lens. The book contains literally hundreds of equations, not to mention inequalities. Building a telescope that can resolve fine detail at the galactic center. Building a telescope that can detect SETI signals buried a thousand times deeper in cosmic noise than what current instruments can extract. Building a fuel-free spacecraft that can fly to other stars at relativistic velocities. Building a two-way light speed communication channel with human starfarers (or aliens) in intersteller space. This sounds like science fiction, right? Our boldest planners are talking about maybe putting humans on Mars sometime in the 2030’s. Actually, the potential accomplishments Maccone describes are not so far-fetched. They are solidly based on the General Theory of Relativity that Albert Einstein described almost 100 years ago. In 1915, Einstein proposed that matter distorts the space and time around it creating a curved spacetime. Thus, there is no such thing as a “force” of gravity. What we perceive as gravity is merely the bending of spacetime by massive objects. In 1919, English astrophysicist Arthur Eddington confirmed Einstein’s prediction by observing an eclipse of the sun. He noted that a star located near the eclipsed sun did not appear to be located where it was known to be. The light from the star had been bent by its passage near the sun. This idea of massive objects bending light was later described by Einstein and others as gravitational lensing. One of the consequences of gravitational lensing is that light coming in from distant stars that is bent by the sun’s gravity will come to a focus on the far side of the sun from the source of the light. A telescope placed at that focus will see a much brighter image than would be possible without gravitational lensing. This explains how we could get high resolution views of the galactic center, where without a doubt a lot is going on. What about SETI? We could aim a gravitational lens telescope at a likely star system where we knew there was a potentially habitable planet, and listen for the aliens’ equivalent of I Love Lucy, spreading across the cosmos in all directions. We could pick up signals a thousand times weaker than what current SETI telecopes can manage. Rather than merely receiving greatly amplified light or microwaves, we can reverse the process and send greatly amplified light or microwaves to a focal point in space. We can use this idea to send a spacecraft to a nearby star at relativistic speeds. On a straight line between the Sun and a target star, Proxima Centauri for example, place the spacecraft at the initial focus of the Solar lens. Back in the other direction, behind the Sun, place a power station that projects a powerful collimated beam at the Sun in such a way that the beam converges on our beam-powered spacecraft. The spacecraft will move out at a constant acceleration as long as the beam stays focused on it. This can be arranged by moving the power station in just the right way to keep the focus always located where the ship will be. This can continue right up to the ship achieving a significant fraction of the speed of light. To decelerate and come to rest at the target solar system, a mechanism such as Robert Forward proposed for his StarWisp vehicle could be employed. Once you have a base in a distant star system, you can use the lenses of both stars to communicate back and forth at light speed. The lensing would dramatically reduce the amount of power needed to get a message across the light years. Although not an easy book to read, Deep Space Flight and Communications is a blueprint for escaping the solar system and moving out into the cosmos beyond. It is the only system I know of that has the possibility of reaching other stars within a human lifetime, using current and near-future technology. DARPA and NASA are conducting an evaluation of interstellar flight called the 100-Year Starship. They envision figuring out how to launch a starship 100 years from now. With the ideas that Claudio Maccone expounds in this book, we could be sending that starship out a whole lot sooner.